Seven Indian girls ran as fast as their little legs could carry them. Panting. Screaming. A grizzly bear hot on their heels gaining ground. In desperation the children climbed a three-foot rock and cried, “Rock, take pity on us; Rock, save us.” And the rock grew upward. The bear clawed and clawed, but he couldn’t reach them. 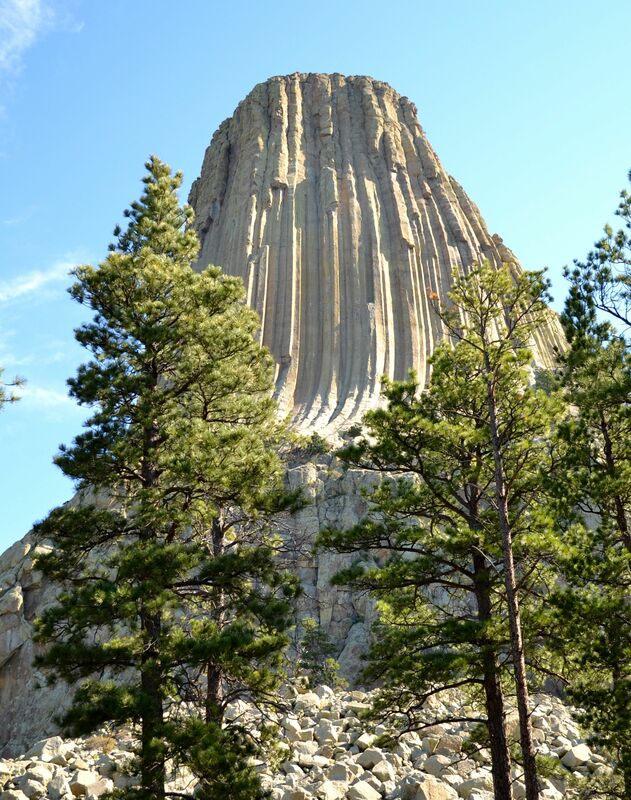 An inspiring Native American legend of how Devil’s Tower originated but with a different name in Lakota: Mato Tipila, which means “Bear Tower.” This story evoked such awe in me as I gazed up at Devil’s Tower in Wyoming. Ok, so maybe geology tells a different story, but the legend bursts with meaning. God is Almighty, and His power knows no bounds. God always has had and still does have the power to push a rock upward, because He is the only One Who could create it in the first place. All things are possible through Him, and He can go through infinite lengths beyond our understanding to protect us from enemies. God protects us from the devil who always stands ready to devour us. When the devil is hot on our heels, clawing his way to our destruction, God provides His Rock, Christ Jesus. The devil can’t reach us there. Jesus is a safe refuge. The devil may roar in our ears, but Jesus will never let him destroy us. The devil may tempt us, but He must flee at the name of Jesus. Devil’s Tower reminded me of when the devil was allowed to tempt Jesus, and he took Jesus to a high mountain and showed Him the splendor of all kingdoms. “All this I will give You,” he said, “if You will bow down and worship me.” Jesus said, “Away from Me, Satan! For it is written: Worship the Lord your God, and serve Him only.” No matter how much the devil tempts, taunts, and torments us, Jesus has already won the battle against him. One word – “Jesus!” – sends him yelping away. Hi Trudy! I thought about telling the story of the Tower, but thought it would make the post too long. It is a beautiful story though, and so descriptive of the rock formation. Yes, the Lord keeps us from evil, whether in the form of a bear or the devil. God be praised! Thank you for providing your link. It was fun to see your photo and to read a different take on the scene. Thank you, Ceil. It was fun reading yours as well. 🙂 Blessings to you, too!